Minister Paschal Donohoe said he would be raising the issue with the Central Bank. It was the policy of Bank of Ireland, where customers with tracker mortgages sought to restructure loans, to add 1% to the tracker mortgage rate as part of the restructuring, the Dáil was told today. Minister for Finance Paschal Donohoe said this “should not have occurred”. “It is another example of the appalling way in which this matter developed and has since been handled,” said the minister. The government has a 14% minority shareholding in the bank. Earlier this month, the bank confirmed an additional 6,000 of its customers were impacted by the tracker mortgage scandal. The scandal has seen all of the main banks in Ireland either denying customers a tracker mortgage product or charging them the wrong rate of interest. The final number of impacted customers is expected to be close to 30,000 once the Central Bank’s examination of the issue has concluded. Donohoe said he would play a role in dealing with this latest issue, and would raise the matter with Bank of Ireland and the Central Bank, but only after the Central Bank has completed its report into the tracker mortgage scandal. Since the tracker mortgage scandal hit the headlines, the minister said he has met with a number of impacted customers. “I have met a number of people who have been directly affected. The Oireachtas committee had met people; I had not. I felt it was appropriate to do so. I met over recent days a representative group of affected people. I already knew about the level of stress caused for people. That has been confirmed to me again,” said Donohoe. The issue of hiking up people’s tracker mortgages by 1% was highlighted by Sinn Féin’s Pearse Doherty, who teased out the issue with the minister in a parliamentary question this week. In the Dáil today, Donohoe said the matter had not been raised with him, and in answering the parliamentary question his department had to consult with the Central Bank on the matter. 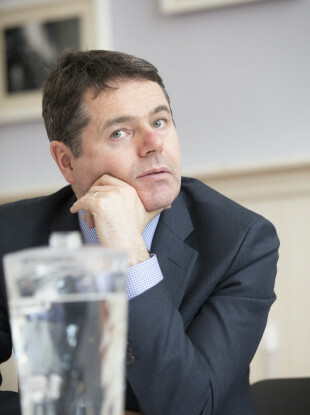 “I will do so [intervene] but I must emphasise to the deputy that the regulatory body dealing with all of this is the Central Bank and that I have to respect the work it is doing in this area and allow it to do it,” said Donohoe. Doherty said it’s his understanding that the 1% was standard practice within the bank. “It was absolutely wrong, therefore. The Central Bank was not aware of this,” he said, urging the minister to take up the issue now instead of having to deal with it months down the line. In his parliamentary reply to Doherty, Donohoe said he had no direct function in the relationship between the bank and its customers. The minister said he got the Central Bank to reply to Doherty’s query on the issue, in which it stated that a lender cannot require a borrower to change from an existing tracker mortgage to another mortgage type, as part of any alternative repayment arrangement offered to the borrower, except in specific circumstances. Expanding on the tracker mortgage issues, Doherty said there is no certainty and no targets for when all 6,000 individuals will be compensated. “People are still not clear on the deadline. They are very unhappy with the deadline set for Ulster Bank, for example. It can be extended for the next seven months,” said the Donegal TD. “I am not happy with the timing the bank has provided to me. I have engaged on this matter with the Central Bank, which is overseeing it. It has indicated that it believes the timescale given is the quickest in which Ulster Bank can do what is proposed, but it will continue to push Ulster Bank to try to have the work done sooner because its timing is different from the timings of the other banks in question,” replied the minister. The issue of adequate compensation was also raised in the Dáil today. Fianna Fáil’s Michael McGrath said the amount of compensation a person gets is “a game of roulette”. “There is no consistency across the various institutions… There is absolutely no consistency. I have given the Minister the figures. The rate ranges from a low of 10% or so up to a high of approximately 30%; it depends on which institution one is with. That is simply not on. Where the harm is the same, the compensation should be broadly the same,” said McGrath. Addressing the issue of getting an allowance for professional advice, AIB is paying customers €615 while Bank of Ireland is paying €250. “This is not on. Even now, people are not being treated in a consistent fashion by the banks,” said McGrath of this, adding that he will ask the Minister to consider this. He said that he believes that the issue of compensation “will become the story eventually” when the institution gets to the bottom of who has to be included. “The compensation issue is coming down the tracks very quickly. The current structure is just not good enough,” added McGrath. The minister said there will be differing levels of compensation for people. The main factor that will determine the amount of compensation is each individual’s circumstances, said Donohoe. “I expect and want everybody to be treated fairly in this matter,” he added. Donohoe said he expected the number of people impacted by the tracker mortgage scandal to rise, stating that he had been told by the Central Bank in a recent update there were about 13,000 impacted accounts at the end of September. “As to whether I expect the numbers to grow, the answer is: Yes, I do,” he concluded. Bank of Ireland has been contacted but could not provide a comment at the time of publication. If you have been affected by the Tracker Mortgage scandal and would like some assistance then please don’t hesitate to get in contact with Fin at info@fodsolicitors.ie or phone-Dublin 01 6854458, Cork 021 4204122, Galway 091 782181. Latest: Here’s how the banks plan to address the tracker mortgage issue. AIB not expecting ‘material’ changes to tracker mortgage provision.